LANCASTER, Pa. – Sept. 20, 2017 – Now, bring it home: JONAH: The Musical!—the first filmed version of a Sight & Sound Theatres® biblical stage epic—releases Oct. 17 on DVD and digital platforms for home entertainment. Filmed live at Sight & Sound Theatres in Lancaster, Pennsylvania, JONAH: The Musical! brings to life the journey of a lovable yet stubborn prophet. The spectacular stage production packs delightful humor, cinematic music, massive sets, amazing costumes and a breathtaking underwater scene featuring a huge 40-foot whale—with one big appetite. When God calls Jonah to offer mercy and forgiveness to the people of Nineveh, Jonah runs straight . . . in the opposite direction. After that, one bad choice leads to another, and soon Jonah’s “getaway” ship is on the verge of destruction in a terrible storm. To save themselves, the ship’s crew tosses Jonah overboard and into the waiting mouth of one ginormous fish. But as Jonah discovers, God will offer anyone another chance—Ninevites as well as runaway prophets. 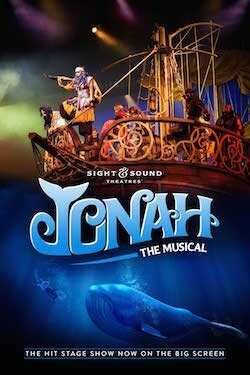 The original live stage show of JONAH debuted in 2012 at Sight & Sound’s theater in Lancaster, then traveled to its Branson, Missouri, theater for the 2014-15 season. An encore season in Pennsylvania runs this year through Oct. 14. For this audience favorite, JONAH flowed to the movie screen as a natural next step. JONAH: The Musical! is distributed by Virgil Films. Posted in Misc., News, Press ReleasesTagged JONAH: The Musical!